Claude E. Payne served as bishop of the Episcopal Diocese of Texas and as rector of one of the largest Episcopal churches in the country. Reclaiming Christianity builds upon his vision for for the church to be mission-minded–to look outward to serve and share rather than focus inward. He is co-author of the best-selling book, Reclaiming the Great Commission. 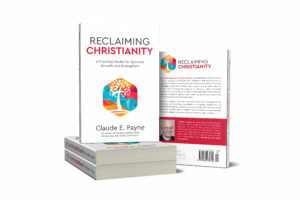 How did the idea for Reclaiming Christianity develop? Christianity has been in decline for half a century. My book exposes its root causes as inadequate understanding of how faith is transmitted and secondly, how internal conflict over theology and explosive issues has pitted the faithful against each other, undermining Christian integrity and degrading mission. The idea for the book stems from finding ways to turn decline into huge opportunity. My hope is that churches and Christians will reclaim an evangelical vision of equipping seekers spiritually for a life-long pilgrimage in faith that leads into eternity, and that this spiritual nurture will inspire them to reach outward to bring health to the degrading aspects of life. An expansion of this vision includes a way of biblical interpretation based on love that will enable Christians who bitterly oppose each other to live into a kind of holy mutual respect. The highest vision is that it will contribute to the development of a better world. Examining spirituality and how it is nurtured. Christianity is caught and then explained on the basis of inherited tradition. The growth of those who claim to be spiritual but not religious documents the reality of spiritual hunger in society and how Christians of strong faith don’t fully comprehend how to transmit that faith to others, including their own children. Christians possess spiritual treasure, deposited in their souls, that continues to grow throughout life. Modern society, including the church, privatizes this strong faith, suppressing its power because it isn’t shared. Identifying this treasure of the soul and fortifying it through sharing it at the congregational level in Christian Formation has been an especially joyful endeavor for me. What would you do if you felt stuck? Wait, pray, and continue to wrestle. Essentially I wait upon the Lord. The Prayer Book prayer used for Fridays: Almighty God, whose most dear Son went not up to joy but first he suffered pain, and entered not into glory before he was crucified: Mercifully grant that we, walking the way of the cross, may find it none other than the way of life and of peace. My guess is that this won’t be the favorite of many. I cherish it because it tells me growth and fulfillment come through my struggles, especially those upon which I rely on divine help. It is the way of Jesus and the way of life. At my desk at home. I am “retired,” actually a misnomer, for clergy vows are for life. Christ, and through a whole host of others throughout life. My wife is foremost among these. Then I have been inspired through personal participation among clergy groups in the United States and Canada, and in congregational Christian formation, about how effectively the models described in my book have worked. I have witnessed the joy it brings. My book is offered in love, especially as it challenges ways to look at authority and current practice. I want the book to be a useful tool that stimulates, inspires, and challenges others to live into a fuller and more fruitful Christian life.